Preservation Durham is a 501(c)3 organization whose mission is to protect Durham’s historic assets through Action, Advocacy, and Education. As a part of this mission, PD created the Endangered Properties Program which, to date, has saved over dozens of structures from demolition. Many of the houses for sale through PD's Endangered Properties Program are contributing structures within National Register Historic Districts. As such, they are eligible for Historic Rehabilitation tax credits. 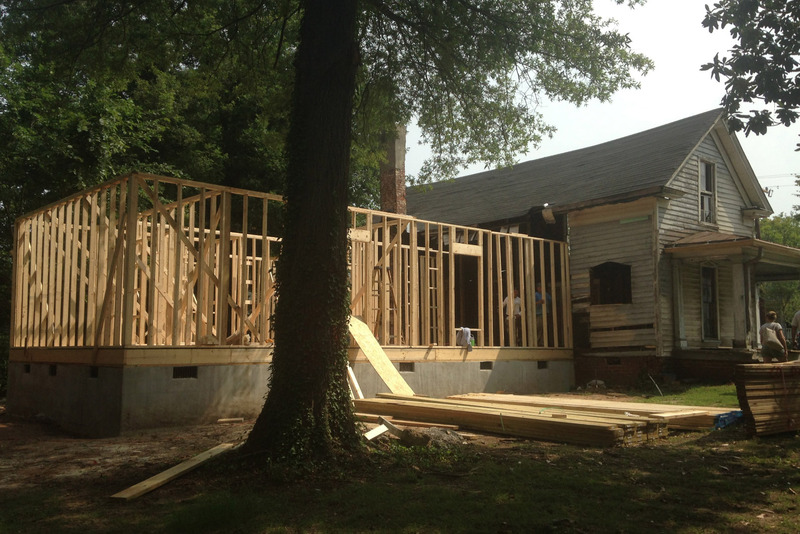 In North Carolina, a 30% state tax credit is available for the rehabilitation of owner-occupied homes. 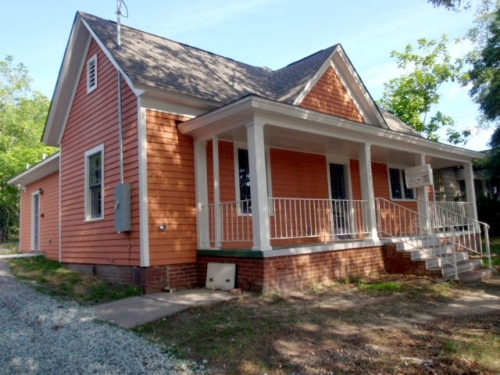 For more information on Historic Rehabilitation Tax Credits, contact Preservation Durham or the North Carolina State Historic Preservation Office. The HPO lists tax credit fact sheets, here: http://www.hpo.ncdcr.gov/tchome.htm. You can also view a map of North Carolina's National Register Historic District boundaries (and other historic assets), here: http://gis.ncdcr.gov/hpoweb/. Other houses for sale through PD's Endangered Properties Program need to be relocated, including a couple of houses that are being offered FOR FREE! 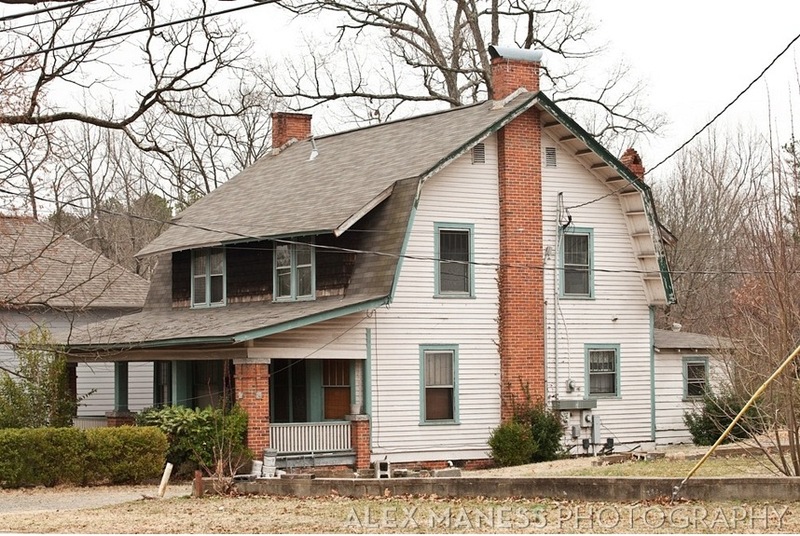 Still other houses are for sale through a partnership program with Preservation North Carolina. 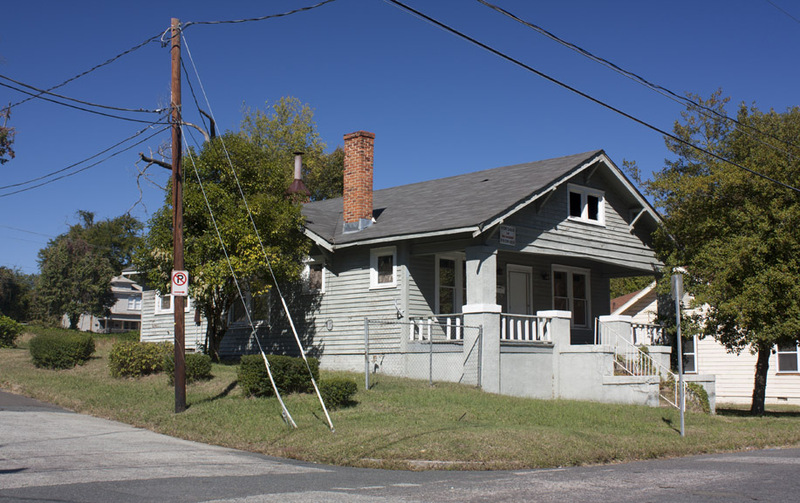 If you are a serious buyer and are interested in preserving the history and integrity of Durham, contact the Preservation Durham office to schedule an appointment. 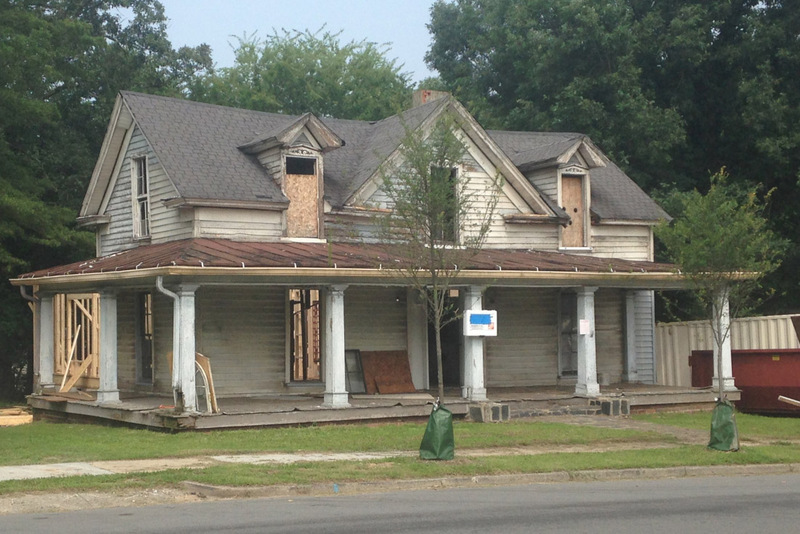 Please ask for Sean Stucker at 919/682-3036, or email PD at info@preservationdurham.org. 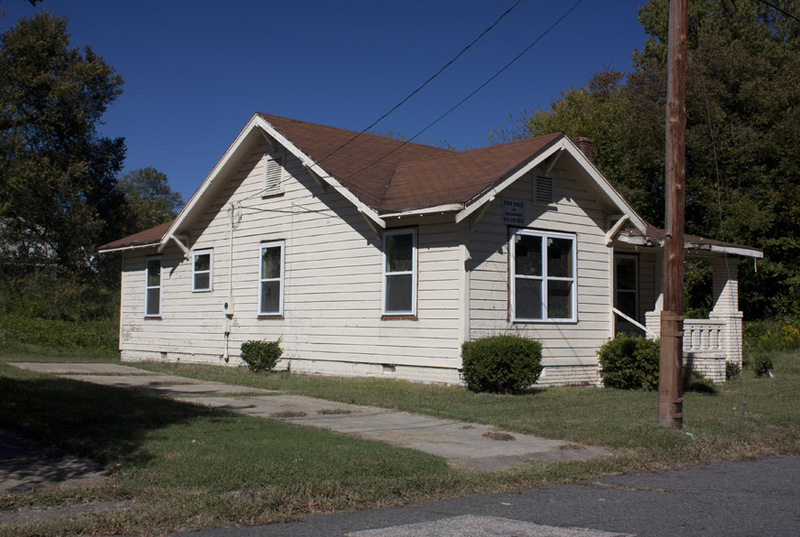 Additional photographs and documentation of the following properties can be found at: http://preservationdurham.org/epf_new/. 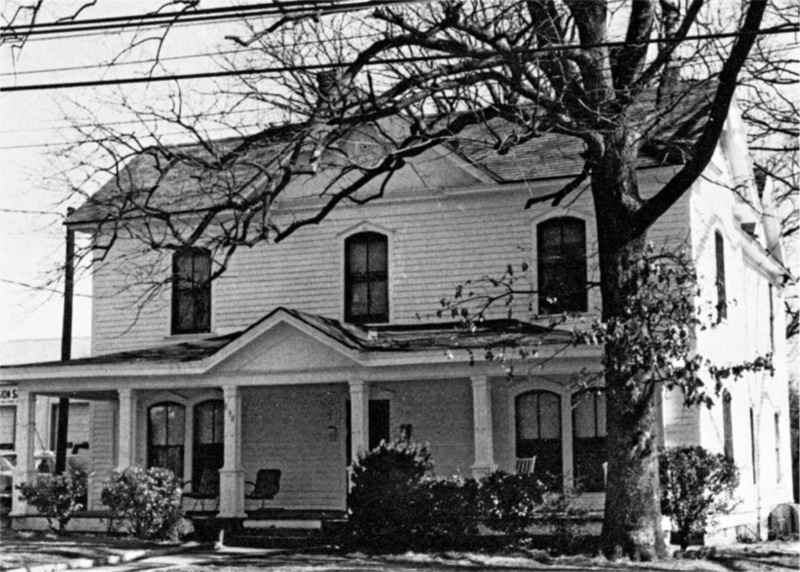 The house at 118 South Driver was built by John W Evans, who was the first superintendent of the Durham County Home around 1900. The house originally sat on land comprising about half of the current block bounded by Hart Street, Driver St., East Main Street, and Robertson Street. Evans only lived in the house a short time, however, dying in 1902. His land was split up among his heirs. Evans land subdivision, 1902. The house sits on "Lot 3"
The house passed to Evans daughter Amy and her husband, Arthur E. Burcham. Burcham was a superintendent at the Durham Hosiery Mills and served on the city council in the early 1940s. The house is unusual in style, 1 1/2 stories with full roofline dormers, as well as a wraparound porch and a large centrally positioned rear wing. This house became pivotal in the future of this neighborhood by the 1990s. Normally, I'm a huge proponent of boosting owner-occupancy in a neighborhood - my experience with 118 South Driver is the only significant caveat to this. I'll start with the take-home message. If you have a drug dealer in your neighborhood, you'd much prefer them to be a renter rather than an owner. I've described previously how the East Durham neighborhood retained some stability into the 1980s - longer than most of the inner neighborhoods in the ring around downtown - but began to plummet badly in the 1990s as the cohort of long-time residents began to pass away. 118 Driver is emblematic of East Durham's trajectory. Well-maintained through the 1980s, the property was sold by a widow in 1991 to a family who would collectively wreak havoc in the vicinity of the house over the next ~15 years. The story is somewhat classic; older couple moves in, patriarch dies, children and grandchildren move in / stay with grandma, and form a little family drug cartel. Members of the family would be arrested / charged (including grandma) with cocaine possession, and the business might slow for a little bit, but it would never stop. 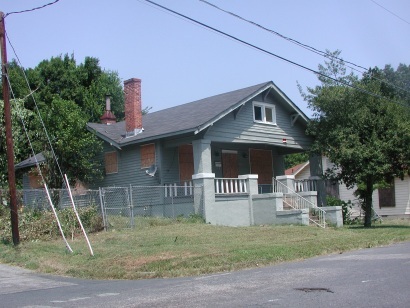 When I first encountered the house around 2004, I had been working hard as chair of Preservation Durham's endangered properties committee to acquire options on threatened houses in order to try to get historic covenants placed on houses at time of sale. John Compton, Carrie Mowry, and I, in particular, had focused strongly on the two blocks of Driver Street between Angier and Main. I felt then, and still feel today, that the uppercase "I" formed by these two blocks, and the two blocks of East Main and Angier to the east and west of Driver form the backbone upon which a revitalization of East Durham would be built. This house - or, more specifically, the trade being plyed from the house, - clearly stood in the way of that revitalization. There are a few wonderfully hardy folk who are brave enough to renovate a house within a block of a drug dealer, but hardly a deep demographic. A combination of the three of us began courting grandma. NIS was putting pressure on the family because of code violations. Ken Gasch and Bill Anderson got the police involved enough to raid the house and make some arrests. All of which set up the surreal experience of Rick Hester of NIS, Carrie Mowry, and I sitting around the living room of this house with the option papers and grandma, grown children standing over us looking none-too-happy. She signed the papers, and within a few months had moved out to north Durham. Preservation Durham marketed the house, but couldn't sell it. 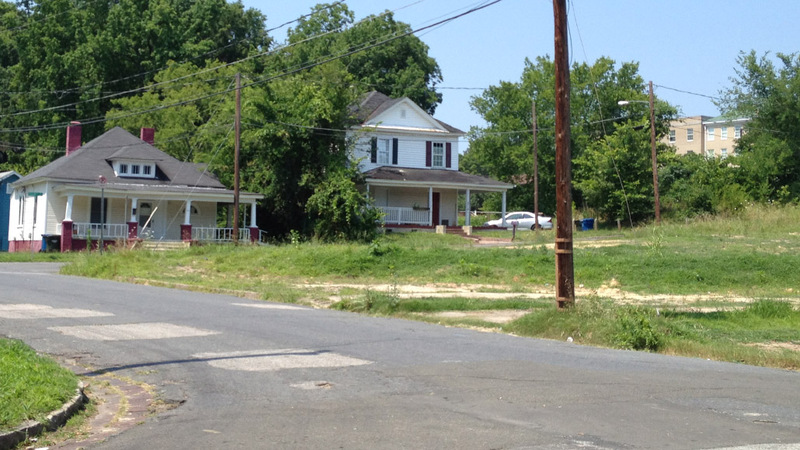 In the meantime, as I became more invested in East Durham and distressed about NIS tearing down house after house on Angier Avenue, our approaches to preservation became incompatible. As of 2014, the building is under renovation by Renovision partners. According to Ervin Roberts, his grandfather, Gaston Roberts, built this extraordinary I-house from 1860-1870, a long construction period no doubt caused by the Civil War. 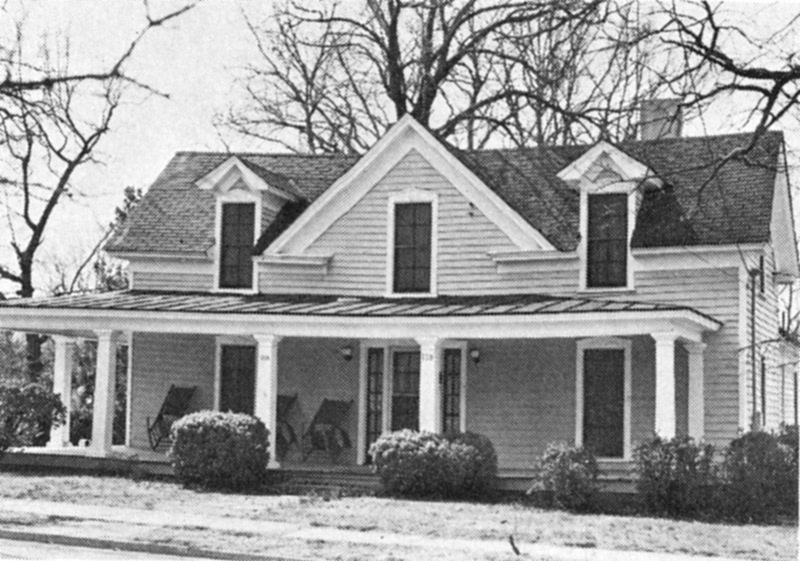 The house is one of Durham County’s best Federal-Greek Revival transitional style dwellings and also includes several Georgian-style decorative elements. In the Federal style, the main block of the dwelling is tall, there is a boxed cornice beneath the eaves, and the roof is flush with the wall on gable ends. Fenestration also follows an early pattern; in the center of the front facade there are paired entry doors flanked by nine-over-six windows in end bays, and above these, six-over-six windows on the second floor. In the Greek Revival style are the four-paneled front doors and simple moldings with small plain corner blocks on door and window surrounds. Flush sheathing that covers the wall between the two entrances suggests that the present full facade hip-roof porch replaced a once-smaller porch. On the south gable end, an original fieldstone and brick chimney remains but its counterpart on the north end is now a modern stove chimney. Metal tiles cover the roof of the main block. The roof of the porch, and a long one-story ell that connects a former kitchen to the house are sheet metal. A shallow back porch is found at the juncture of the ell and the main block. The dwelling has an unusual variant of the hall-parlor plan; the two rooms do not access each other on the first floor, and the second-floor can be reached only from the hall. The ell has direct access from the parlor but must be entered from the hall by crossing the back porch. All rooms are finished with wide hand-planed boards. In the hall, exceptional decorative woodwork is found: horizontal wainscoting has traces of painted graining, a fine Georgian-style paneled mantel and eight-panel door leading to the back porch may have been taken from an earlier dwelling; and a Greek Revival double-vertical-panel door opens onto a boxed stair. There are several log outbuildings near the house, a V-notched double-crib barn, a diamond- notched corncrib, and a one-pen square-notched tenant house. 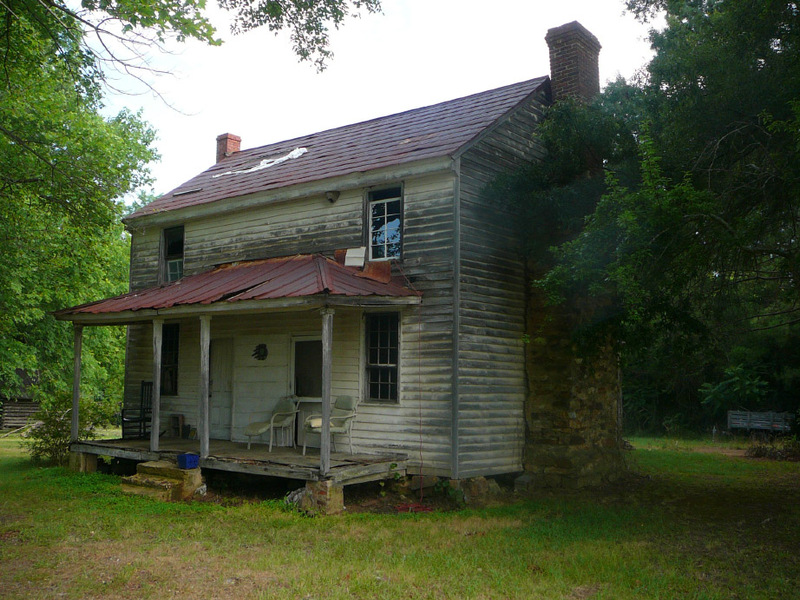 Unfortunately, as of 2011, the house is abandoned and for sale to be removed from the property. Likely built in the first decade of the 20th century, 213 South Driver was likely remodeled in the 1930s or 1940s, giving the porch and the interior a more mid-century feel. 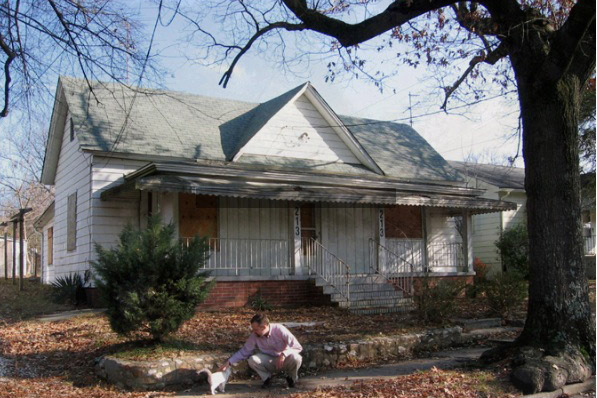 Back in 2005-6, before foreclosure was a household word, I ID'ed this as a potential property to help the revitalization of this corridor while working with Preservation Durham. 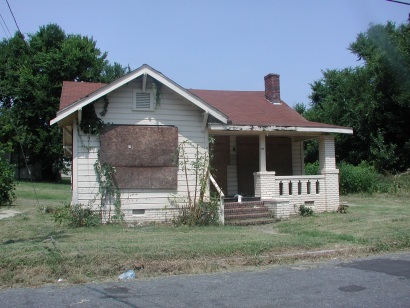 I spent months navigating the intricacies of the REO world on this and two other properties that I hoped to get donated to Preservation Durham. Two banks just weren't willing to try to make something work, but I found the folks at Bank of America, which owned 213 S. Driver, to be sympathetic to what we hoped to accomplish in the neighborhood. 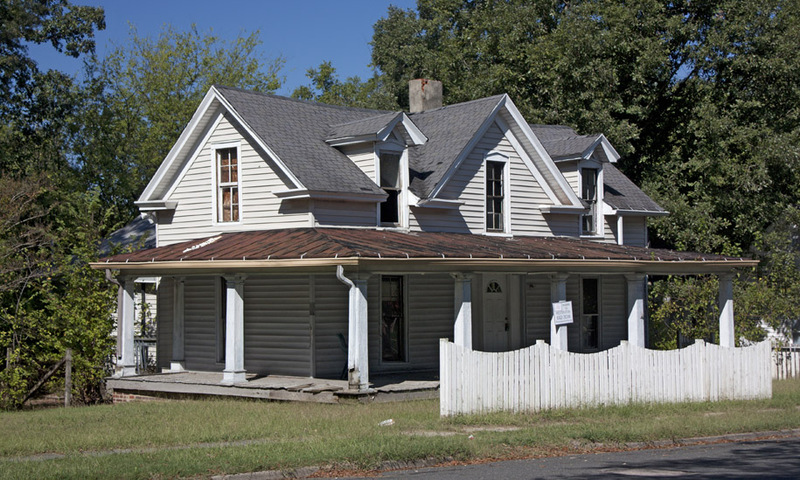 It was a long process, but ultimately successful, as the house was donated to Preservation Durham in May of 2006. A big thanks to Bank of America - particularly David Tiberio, then-Vice President and Manager of the Real Estate Office in New York for going outside the box to make that happen. Unfortunately, Preservation Durham was unable to sell the property or do much with it after that - I stopped being involved in the organization in mid-2006, so I can't speak to the difficulties, although I'm sure money was an issue. But it has been a shame - and I particularly felt embarrassed regarding the revitalization picture I painted to BoA that it has stayed in a dilapidated state this long. Fortunately, Preservation Durham and Preservation North Carolina have started to renovate the house over the past few months; I believe, based on a conversation John Compton and I had about Scientific Properties' use of CDBG funds from the city to renovate 1102 Wall Street that they've made similar use of the funds. 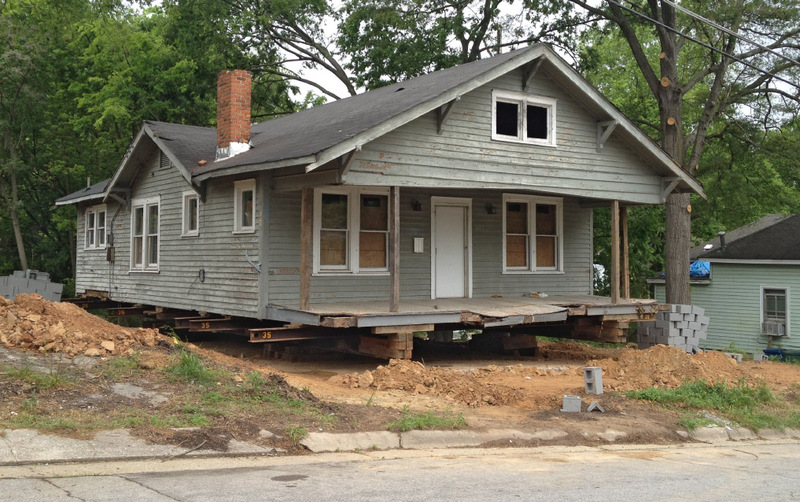 Kudos to them for finding a way to get this house moving forward and a part of the revitalization of East Durham. 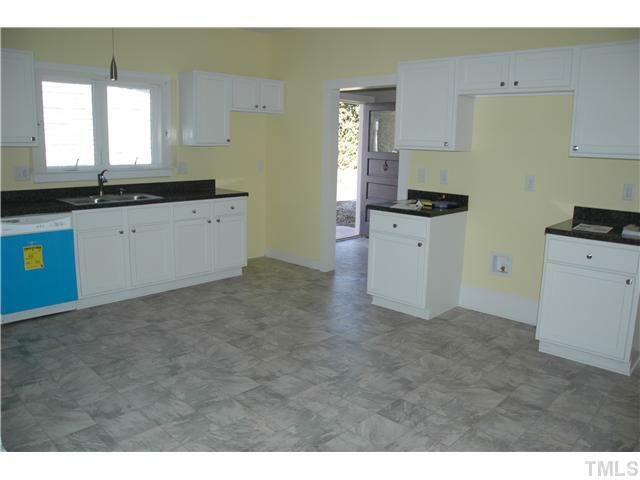 Completed house, summer 2011 (Courtesy PNC); under contract Summer of 2013; back on the market in fall of 2013. 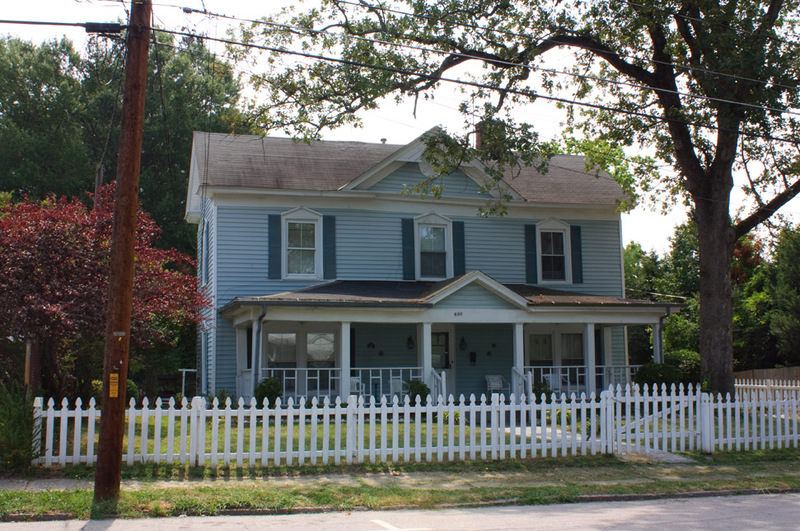 1-story tri-gable house with 6-over-6 sash windows and a full front porch. Alterations include aluminum siding, boxed porch posts and a metal railing, and replacement front wndows. Along the front yard is a stone retaining wall. 1930 CD: Demetrius Carlton occupant (mill hand). C Garage. Ca. 1930. Front-gable garage with metal siding. 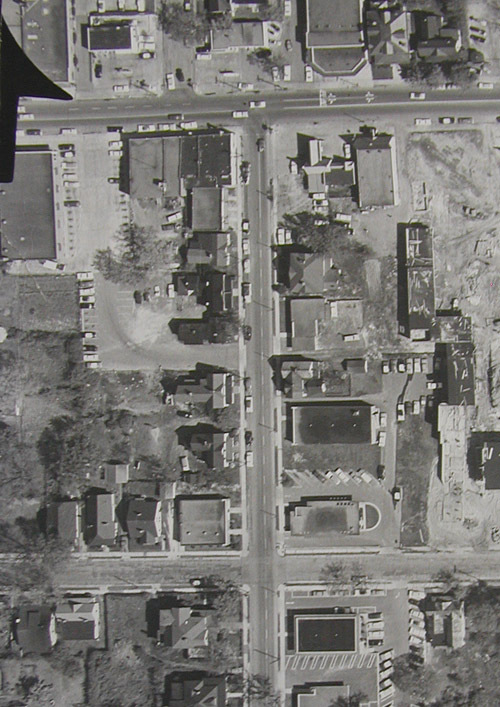 The 600 block of Vickers began as a residential block with the eastern end of the West End commercial district at its intersection with West Chapel Hill St. The larger houses along the ridgeline of West Chapel Hill continued to some extent within this first block away from the ridge and trolley line, but the houses were generally less elaborately detailed. 607 Vickers was occupied by Rosa Petty and Andrew Petty ("gatekeeper,") as well as Miss Clara O. Petty (tchr West Durham School) in 1915. In 1919, only Rosa was an occupant. 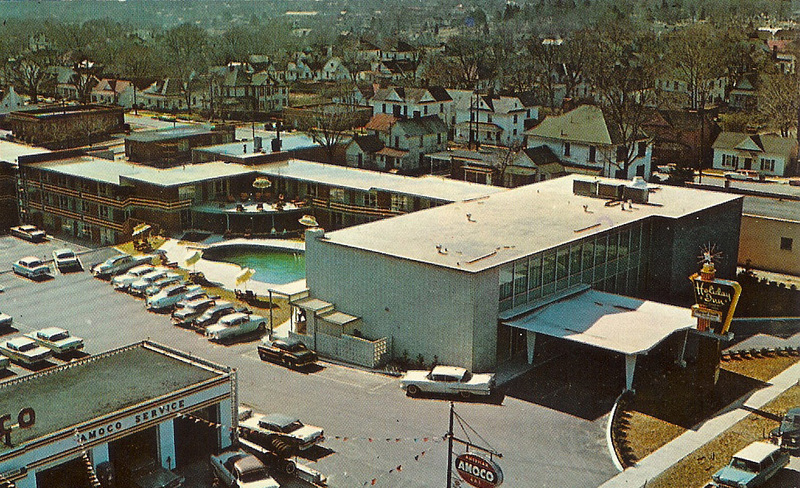 By the 1950s, West Chapel Hill had significantly transformed into a more commercial corridor, and small businesses had begun to supplant the houses in the first block south of that corridor. 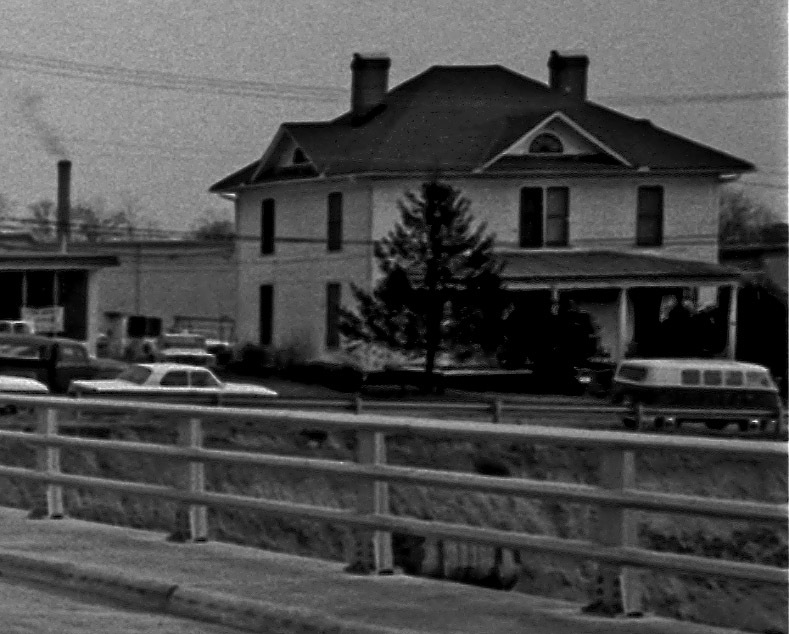 The curve of the Durham Freeway through this part of the city in 1967 brought it in parallel with Vickers so that it would intersect West Chapel Hill St. at a right angle. Thus while the freeway removed the 700 block of Vickers, it curved to remove the entire west side of the street in the 600 block leaving the eastern side of the street intact. I don't know the original purpose of many of the businesses on this street, although the structure on the northeast corner of Jackson and Vickers was a Fidelity, later Wachovia, bank. Today, the eastern side of the block has a motley asortment of offices - day care, a physician's office. One house remains from the early character of this block, the house at 607 Vickers. Despite the ongoing change around it, this house somehow perseveres, even with the demolition of the old Holiday Inn behind it in 2013. Sited on the west portion of lots 1, 2, and 3 of block 43 of the B. L. Duke property, which was laid out in 1901, these lots originally fronted Patra Street (now Roxboro Street), which was on their east side, and were bordered on the north by Park Avenue (now East Markham Avenue), the west by an alley (since covered over), and the south by lot 4. 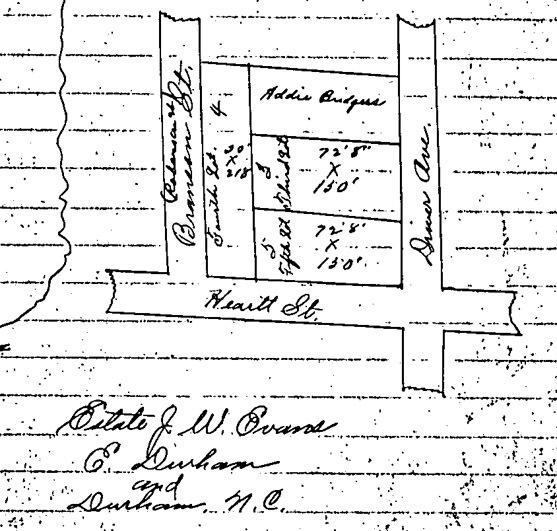 The three lots in their entirety were sold by the Duke Land and Improvement Company in 1920 to William A. Barbee for 00. Barbee then divided them not into individual lots 1, 2, and 3, but rather divided them vertically so that the lots fronted Park Avenue instead of Patra Street. The western portion of this divided property was sold by Barbee to Martin R. New in April 1920 for 00. (Both men were near neighbors living on Holloway Street at the time.) New then sold the property to Ernest T. Rogers in September 1921 for 25, earning a fairly sizable return on his investment. Sometime soon after this, Rogers commissioned the house we see today on this lot at 106 East Markham Avenue. Distinguished chiefly by its gambrel roof and flaring eaves (often thought of as barn-like in appearance), the Dutch Colonial Revival style is also reflected in the large shed dormer, gable-end chimneys, and multi-light windows (here, five vertical panes over one). As in Colonial Revival houses, of which the Dutch Colonial Revival is a subtype, one finds an emphasis on a symmetrical facade, an accented front entrance (here with sidelights), and symmetrical windows hung in combination (here double central bays on either side of the front entrance and paired windows in the dormer). 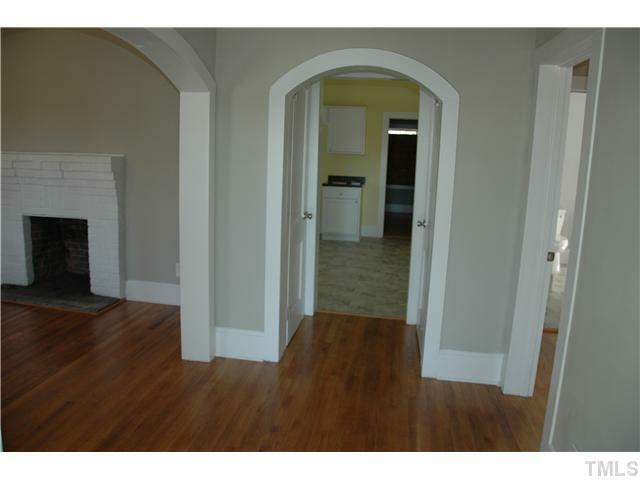 Along with these elements, however, one finds strong Craftsman characteristics featured in the house as well. The eclecticism hints that the house was designed by an architect rather than built strictly from a published plan book. The porch, running the full length of the house, is supported by thick brick piers on either end and box posts on brick piers in the center. Inside is a Craftsman-style brick fireplace, and much of the interior woodwork retains its beautiful, unadorned dark richness. As originally configured, the home’s front door opened into a handsome foyer. A large dining room is found beyond French doors to the right. Behind this would have been the original butler’s pantry and kitchen. Off the back of the kitchen was a porch (now an enclosed room). To the left of the entryway is the front parlor with fireplace, and behind this is another large room, perhaps a downstairs bedroom or a music room. Immediately beyond the foyer, a long staircase leads to the second floor. While it is difficult to imagine the original layout upstairs, it appears there would have been four large bedrooms and one or two baths. 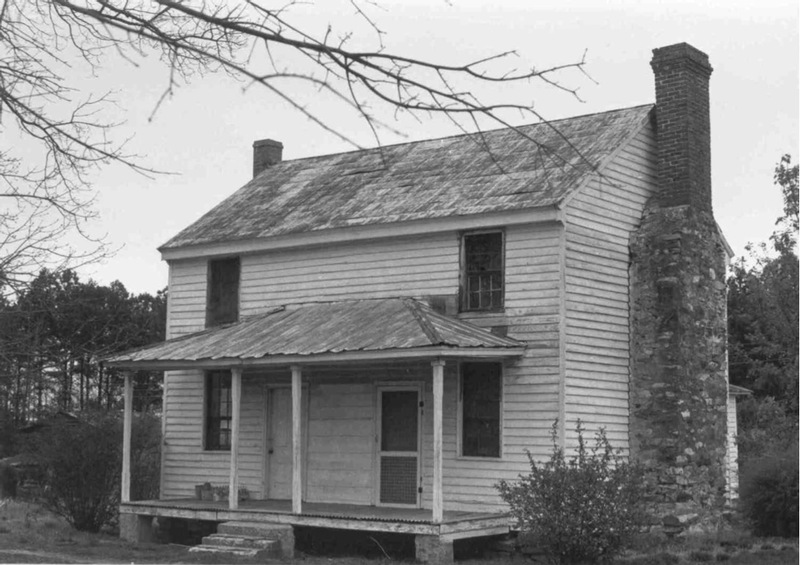 It cannot be confirmed that Ernest T. Rogers and his wife Alice Veasey Rogers ever lived in the house they had built. By 1919, city directories show them living on the north end of Mangum Street, but no number is given to their house. By 1925, they had moved to a small tobacco farm in Bahama. It is certainly conceivable that after Rogers purchased the property in September 1921, he had the house built soon thereafter and occupied it until the family moved to Bahama. The house first appears for certain as 106 E. Markham in Durham city directories in 1926, when Marvin A. Roycroft and his wife Lyda reside there. Roycroft was a partner, along with his father and brother, in Roycroft’s tobacco warehouse, and lived with his wife in the house through 1933 when they moved to 916 Green Street in Trinity Park. The home’s next resident was Ernest T. Rogers’s mother, Lucy B. Rogers, who lived at 106 E. Markham until her death in 1936. After this time, the house went through a variety of residents year after year. Ministers, servicemen, office secretaries, and cabinet makers, a steady stream of everyday Durham heroes made this their home. Ernest T. Rogers, who owned the house, died in 1931, and his wife Alice continued renting the house to others. She remained on the tobacco farm in Bahama and eventually remarried a man named Timothy N. Young. At some point (City directories suggest the 1960s. ), the house was split into three apartments, and one can see today how a wall was added in the middle of the house, separating the large downstairs living space into two separate areas, with the upstairs becoming another apartment. After her second husband’s death in 1971, Alice Rogers Young returned to live out her final years in the house that she and her former husband had owned for so long. 830 North Mangum, looking northeast, late 1970s. The Conrad House, at 830 N. Mangum, has always felt like a bit of an oasis to me - while boxed in by fairly bleak surroundings to the north and south, it retains the early 20th century character that once predominated along this block of North Mangum St. Built in 1910 by Joseph Conrad (not that one) the house is adorned with multiple distinctive Victorian architectural elements, such as the pedimented window casings, the medallion and decorative barge boards in the front gable, and the paired front windows. The original decorative box posts have been lost unfortunately, and the original curved-top window sashes have been removed as well. But overall, much of the distinctive character of the house is preserved. I hope it can persevere. The earliest schools in East Durham were two one-room schoolhouses - one, called the Cherry Grove School, was located near the present-day intersection of Liberty St. and North Driver St. The second was the Oak Grove School, located south of the railroad tracks on the later site of the Durham Cotton Manufacturing Company. 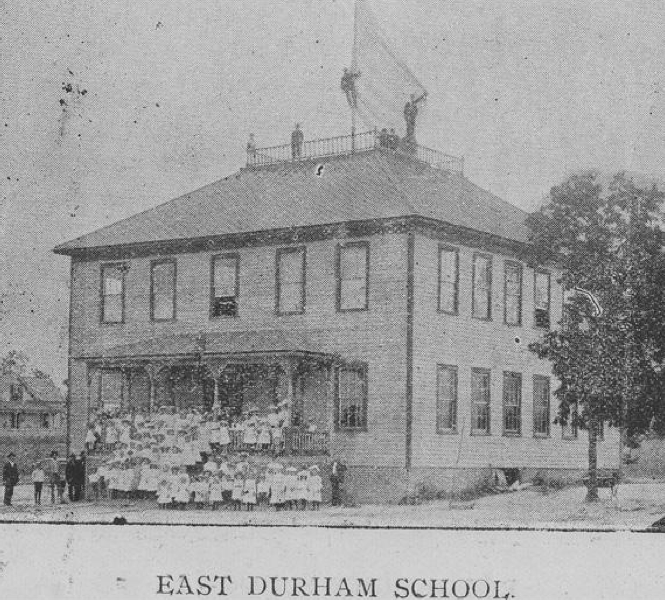 The first East Durham Graded School was built in the 1890s on South Driver Street, just south of East Main Street. The frame structure, pictured above. It contained 7 classrooms and an assembly hall. It was an 8 grade school with a 36 week term. In 1903-1904, the total enrollment was 337 students with an average daily attendance of 192 students. 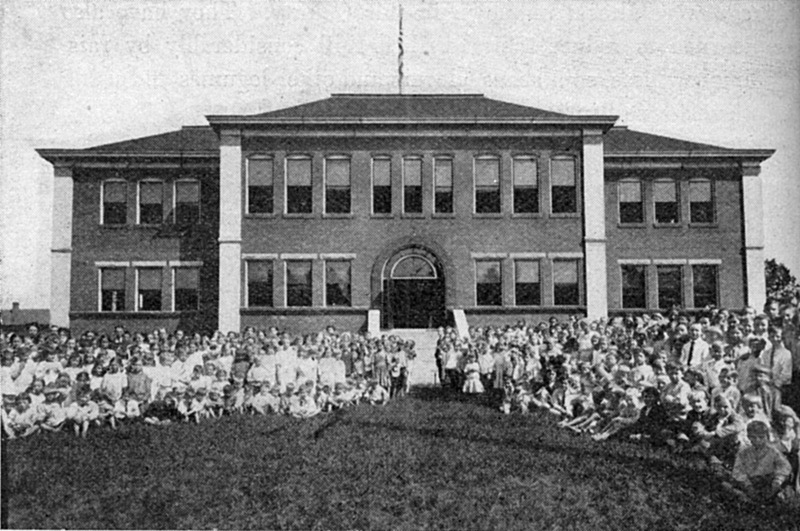 The building and grounds were valued that year at 00, and the school sat on an acre of land. LH Kincaid was principal, and the teachers were LW Cameron, Bettie Barber, Mary McIntosh, Bessie Proctor, and Zora Habel. Their salary was per month. In 1905, a special tax election allowed the school to expand to a nine month term with five teachers paid per month; it had "one grade of high school"
In 1909-1910, the original school building was replaced by a new masonry brick structure, designed by Fred Githens of New York architectural firm Tilton and Githens. Githens also designed the West Durham Graded School No. 2, completed in 1912. The two schools bore a strong resemblance to one another. 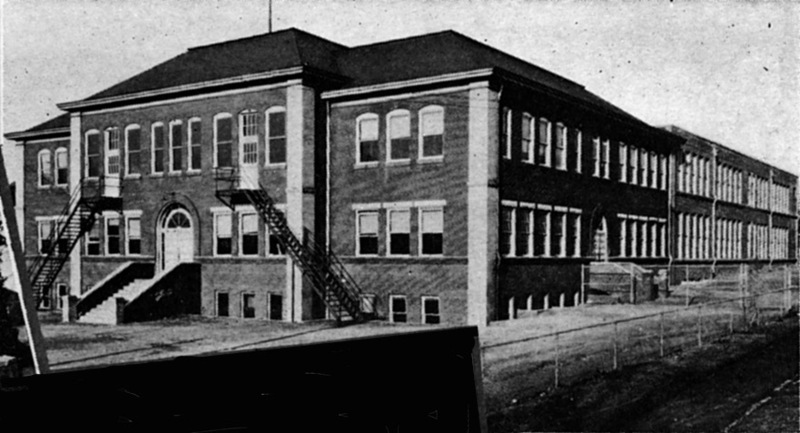 The new building was complete in time to be occupied during the 1909-1910 school year. 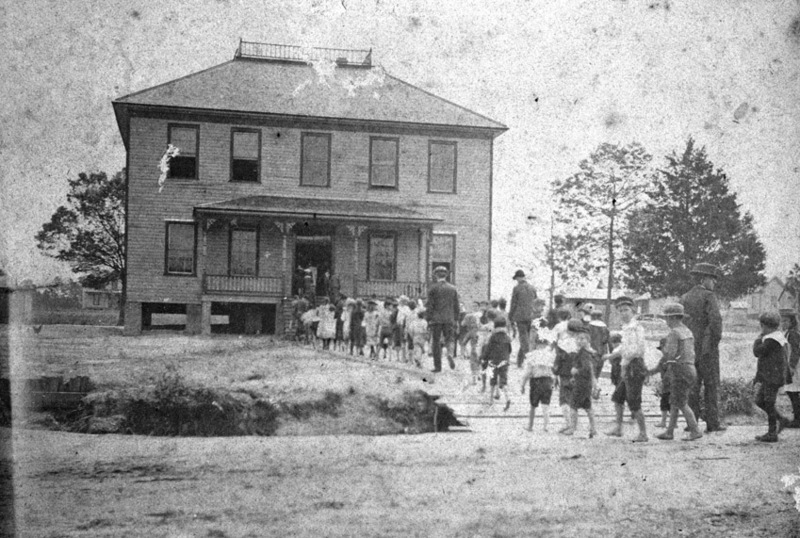 East Durham Graded School, 1910s. In 1913-14, the Graded School added 3 grades of high school, allowing students to graduate with a high school diploma - the average daily attendance was 421 students. 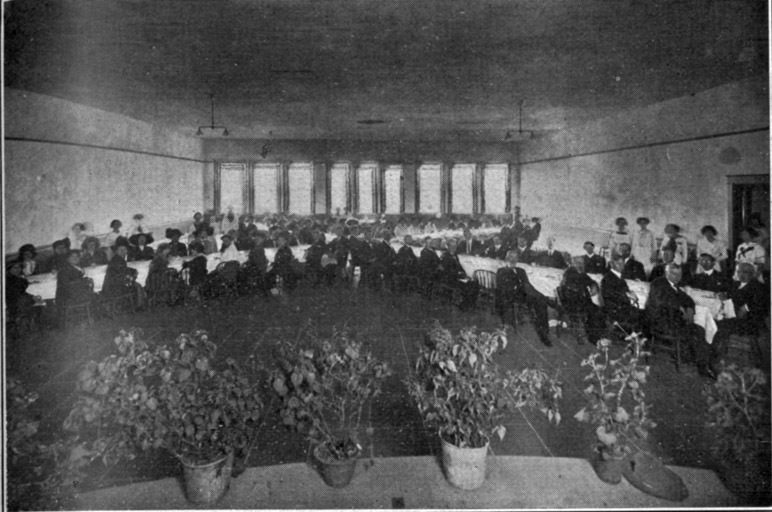 Graded School class 1915. What struck me most about this picture? The feet. In 1920, two wings were added to the rear of the school, extending it to the east. Likely at some point soon thereafter, the space between the wings was infilled with a gym / auditorium, although the gym, with its pitched roof, looks as if it could have been a separate structure from the main building - built between 1913 and 1920 - and connected to the main building by the flat-roofed wings in 1920. In 1925, East Durham was annexed by the City of Durham. The East Durham Graded School then became known as the Y.E. Smith school, so named for the former chair of the school board. Thirteen students, the last to receive their high school diplomas from the school, graduated in 1925. The school is noted as the East Durham Junior High School on the 1937 Sanborn Maps; because there is no other clear elementary school operating in East Durham during that period, my guess is that the school served as elementary and junior high, during the late 1920s-1930s, with students heading to Durham High School thereafter. By 1980, the historic inventory notes that the building was being used by a "sheltered workshop operated by the Durham Exchange Club." The Exchange Club continued to own the building until 1998, at which point they sold the building to TROSA. TROSA intended to renovate the building as a residential structure, but ultimately found that they were unable to execute the renovation. 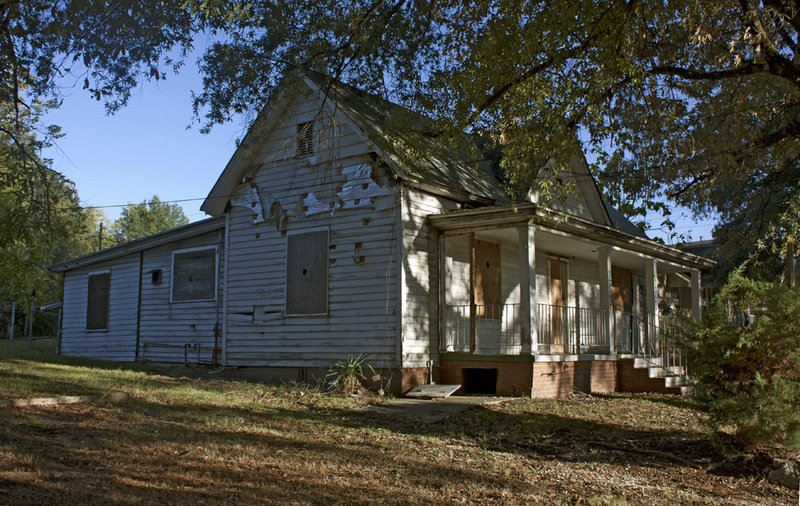 Preservation North Carolina has had an option on the purchase of the building since 2008. As of early 2011, Self-Help has a contract on the property. They plan to purchase and completely renovate the school building to be reactivated and become - a school again. The amusing part about it (amusing since I'm not the one having to go through it) is that Self-Help actually needs to rezone in order to put a school back in the school building. The school is the Maureen Joy Charter school, currently located on Cornwallis Road. I'm no expert on schools, and I'm not too interested in a discussion of the relative merits of one school versus another. But from what I read online, it appears that Maureen Joy is well-regarded and will be a strong asset to the area by relocating to East Durham. That has the potential to bookend what I consider the critical area of stabilization for East Durham - South Driver at Angier to South Driver at East Main. As a large, persistently vacant property, the school has brimmed with potential - but has also been a sign of disinvestment. Revitalizing the oldest school building in the city, bringing the activity of kids and parents to South Driver Street, and creating a strong asset for residents of East Durham in providing a neighborhood school is a win-win-win. Around the corner from 502 and 504 Roxboro (which I wrote about several posts ago) on Queen Street are these great small Craftsman houses. Unfortunately, they have the same owner as 502 and 504 North Roxboro. Together with those damaged houses, and other parcels owned by Mr. Bradford, they form a chunk of property that takes up about 2/3 of the block. This one-story, Craftsman-style bungalow is three bays wide and quadruple-pile. The house has a stuccoed brick foundation, wood weatherboards, an asphalt-shingled, front-gabled roof and two interior brick chimneys. The full-width engaged front porch is supported by stuccoed brick posts on stuccoed brick piers with concrete caps and has a pointed arch span and a replacement wood rail. The house has a pair of small casement windows in the front gable and brackets lining the front gable and two low gables, one on each side of the house. The house is vacant and all of the windows have been boarded save for the two small windows in the front gable. It stands on an overgrown lot on the northwest corner of N. Queen Street and Elliott Street and is accessed by concrete stairs bordered by stuccoed brick kneewalls with concrete caps. Little is known of the early history of the house, but its first known resident was Clement V. Schrader in 1934. This entire neighborhood is severely threatened by neglect, those who are amassing parcels as an investment, institutions looking for surface parking, and a city that 'fixes' such problems by knocking down houses. 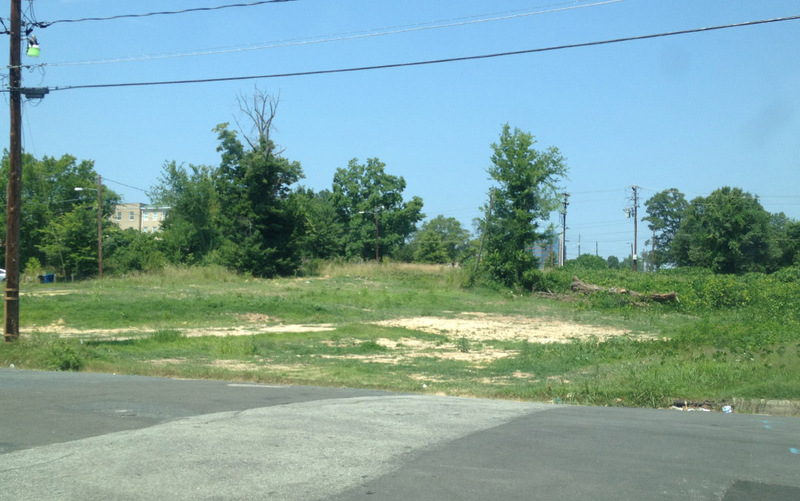 No non-profit, city agency, or downtown booster organization is fighting for the integrity of this neighborhood. It is a common tactic by absentee landlords (another top 5 winner in the anti-preservation sweepstakes) to milk historic properties for all they can get out of them, investing nothing in them. Once the properties become truly uninhabitable (because they push it way past what should be the definition of habitable), they wait for the city to tear it down. If the city doesn't move quickly enough, they push people to complain about the property. If that doesn't work, sometimes there is a fire, which can always be ascribed to the homeless folks who were squatting in the house. 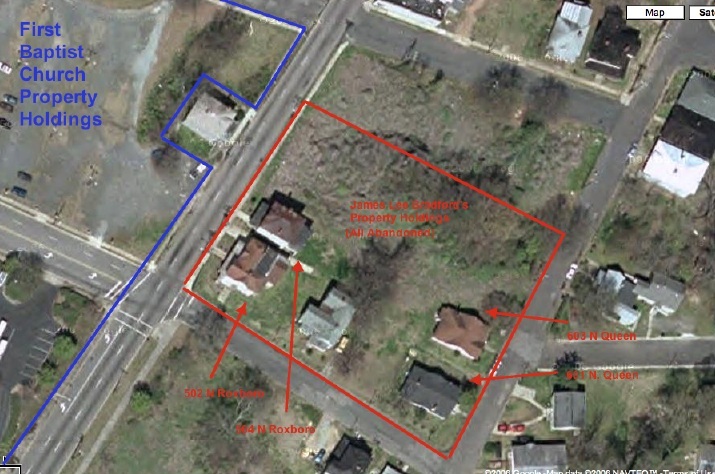 James Marvin Bradford's abandoned property, outlined in red, including 502 and 504 N Roxboro (see my earlier post) and 601 and 603 N Queen. Update: Four years have passed, and this mess is still going on. Bradford thinks he is going to sell these houses to someone to move for him, saving him the demolition costs - all for a development pipe dream that will never come to pass. Meanwhile, two houses that could be part of the rejuvenation of Cleveland-Holloway continue to rot and bring down the neighborhood. This should be criminal. 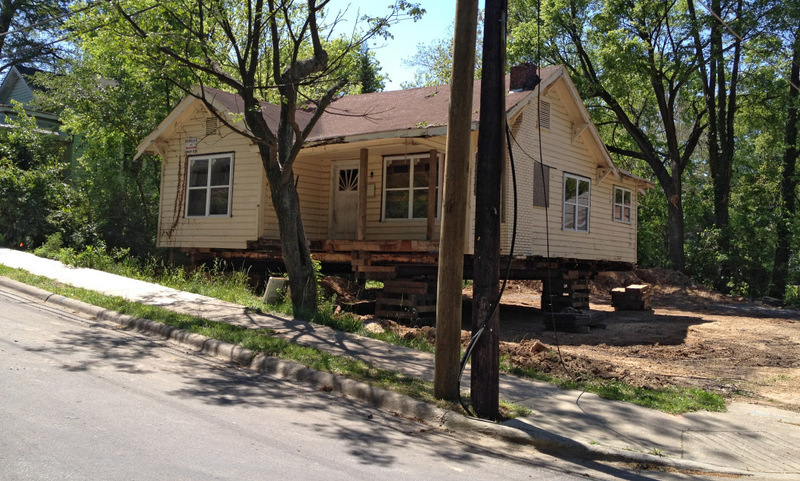 On 04.04.12, this house was moved to 513 Gurley Street. The former site at 601 N. Queen. Bradford and Galifinakis will continue to plow ahead with their grand plan to build an apartment complex on this block. I honestly don't think they have the experience or capital to get it done, or they would have by now. Apartments simply aren't that hard to build. And given the quality of Bradford's other projects (and I use that word intentionally,) I would expect plastic fantasticness if it does. This one-story, Craftsman-style house is three bays wide and triple-pile. The house has a painted brick foundation, German-profile wood siding, an asphalt-shingled, side-gabled roof, and two brick chimneys. A projecting front gable on the left (south) side of the façade shelters a small room. An engaged front porch fills in the space between the main block of the house and the projecting bay. This porch is supported at the exterior corner by a painted brick post on brick pier. A simple square wood post has been added to the brick pier with concrete cap at the top of the stair and a brick baluster with concrete cap runs between the piers. The windows and doors of the house are boarded, but rectangular louvered vents are visible in the gables, which have Craftsman-style knee brackets. A one-story, hip-roofed rear addition runs the width of the house. The house’s first known resident Arnold R. Thompson is listed there in 1934.